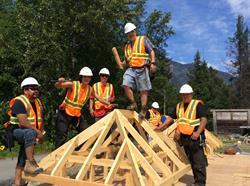 BELLA COOLA, BC--(Marketwired - June 19, 2015) - The Industry Training Authority (ITA), Nuxalk Nation band, and Camosun College School of Trades and Technology have partnered to develop an innovative carpentry training program for Aboriginal People that will break down barriers to accessing trades training and build skilled labour capacity for the region. Bella Coola's Nuxalk Nation band identified a challenge common to remote regions in BC -- the difficulty in accessing skilled trades training. The community identified the need for a trades training model that would help them with both apprenticeship training as well as develop the training capacity of their existing community of Red Seal journeymen. The four-year Carpentry Apprenticeship program is designed to meet these needs. On June 8th 2015, first year apprentices celebrated their Level 1 completion with the community, and are currently on track to complete Level 2 in April 2016. The recent steps ITA, Nuxalk Nation and Camosun College have taken directly align with B.C. 's Skills for Jobs Blueprint to increase the number of Aboriginal People in the skilled trades by 15,000 over the next 10 years. B.C. is reaching a tipping point with fewer young people entering the workforce than older workers leaving it, and we are taking steps now to meet the needs of our rapidly changing labour market. It is imperative that innovative trades training programs are available within smaller communities to ensure successful outcomes for the future. Added 6 Apprenticeship Advisors that are focused on supporting apprentices within Aboriginal communities. There are a total of 15 Advisors. Launched a Best Practices Guide to Attracting, Training, Employing, and Retaining Aboriginal People in the Trades. This guide shares the lessons learned by these organizations in how to design a program that will assist Aboriginal people with finding the trade that works for them and succeed in becoming a registered tradesperson. Consulted with over 400 British Columbians about the Enhanced Construction Craft Worker training and employment program that will support Aboriginal People to enter this trade. The pilot will begin in fall 2015. Delivered Aboriginal Awareness training to over 40 ITA employees. Later this month, ITA is launching an Aboriginal Skills Training Plan 2015-18. "The new Aboriginal carpentry training program being developed by the ITA, Nuxalk Nation and Camosun College will help ensure Aboriginal people have the education, training and support they need to find their fit in our diverse, strong and growing economy," says Shirley Bond, Minister of Jobs, Tourism and Skills Training and Minister Responsible for Labour. "Partnerships like this will help to increase Aboriginal participation in skills training programs, which will be critical to the success of our economy in a rapidly-changing labour market." "This is a very exciting time for the Bella Coola region as the community is championing their own trades training development," says Gary Herman, CEO, ITA. "Nuxalk Nation's innovative initiative will help to increase Aboriginal participation in skills training programs, and will draw upon talent and capabilities that are vital to the success of BC's economy." "Camosun College School of Trades and Technology has been proud to partner with ITA and Nuxalk Nation to help bring this unique training program to Bella Coola," says Olaf Nielsen, Chair Trades Development and Special Projects at Camosun College. "We have been both very moved and motivated by the impact on the community in terms of personal achievement of the new apprentices, the capacity being built, and the legacy created." "The Bella Coola carpentry training program has far exceeded our expectations," says Richard Hall, Asset Manager, Nuxalk Nation. "Working with the ITA and Camosun College has been excellent, and our apprentices have had the opportunity to develop both personally and professionally with the support of our community." "I feel very fortunate to have completed my Level 1 carpentry training," says Tommy Walkus, first year Carpentry apprentice. "It has been a great experience that has taught me many valuable lessons such as building codes, surveying, and blueprint reading to name a few. I am very thankful to have worked with such wonderful teachers who have shared their knowledge with me." The Industry Training Authority (ITA) leads and coordinates British Columbia's skilled trades system. ITA works with employers, employees, industry, labour, training providers and government to issue credentials, manage apprenticeships, set program standards and increase opportunities in the trades. ITA is also a key collaborator in the B.C. 's Skills for Jobs Blueprint, which sets out a plan for re-engineering our education and training system to support our growing and changing economy, and to help British Columbians take full advantage of the opportunities presented by these changes. The Nuxalk Nation is the band government of the Nuxalk people of Bella Coola, British Columbia. It is a member of the Oweekeno-Kitasoo-Nuxalk Tribal Council, and has a population of 1,479. Camosun College is located in Victoria, British Columbia with two campuses that serve approximately 18,000 learners a year in certificate, diploma, bachelor's degree and continuing education programs. It is the largest trades education provider on Vancouver Island, and welcomes over 1,100 Aboriginal students from 50 nations including Métis and Inuit groups, and over 1,100 international students from 40 different countries.